Discuss glare-control and daylight-harvesting strategies for sites that dictate a less-than-optimal solar orientation. Describe digital tools useful in facade design, including those for understanding thermal performance and for daylight simulation. Describe the components in a “perfect wall” system and explain how these are typically assembled. Understand technical terms and concepts relevant to facade design and building physics, including U-value, thermal bridging, and stack effect. Like the layers of atmosphere that protect our planet from the extreme temperatures and radiation from space, facades provide buildings with the filters and shields that make them habitable for living, play, and work. “The facade is the interface between humans and nature. Our job is to elevate that relationship as much as possible,” says Steve McDowell, principal at Kansas City–based BNIM. One could argue that this has been true as long as there has been shelter and architects. But now sustainability-minded firms like McDowell’s are demonstrating ways to enhance this experience while exploring new tools and approaches to fine-tune energy efficiency and user comfort. BNIM’s Block D in San Diego has features that help maintain comfortable interior conditions for the majority of occupied hours, without use of the mechanical climate-control systems, including sliding red sunshades and overhanging floor slabs. When BNIM began discussing the design of the 60,000-square-foot Block D office building in Makers Quarter, a new urban district in downtown San Diego, the clients hadn’t been considering a high-performance building. 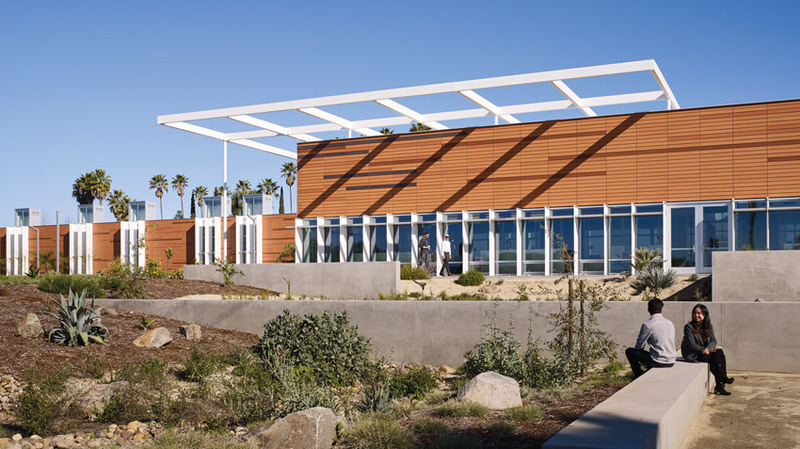 But the firm, which has a history of energy-efficient design that dates to the 1970s, convinced them that such a structure would demonstrate environmental stewardship, provide long-term utility savings, and help attract tenants. 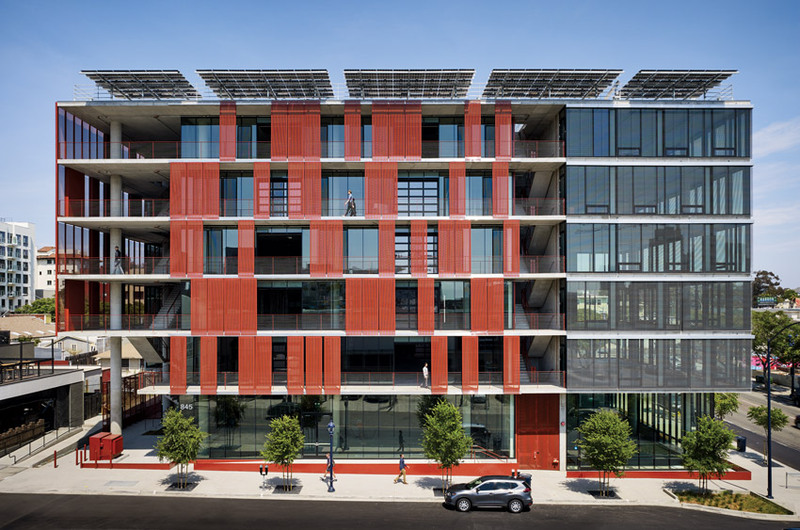 Its unusual skin, which includes bright red sliding screens, along with other elements for harvesting daylight and controlling heat gain, is a key aspect of the building’s efficiency. It is designed to consume 41.6 percent less energy than a building that complies with the ASHRAE 90.1 standard. Block D’s 174 kW rooftop photovoltaic (PV) array is expected to make it a net zero building (one that produces as much energy, from renewable sources, as it consumes over the course of a year). Site constraints dictated that the six-story concrete-framed structure, which opened last year, be elongate on the north–south axis, with its front, mostly glass facade facing west, toward the harsh afternoon sun—a less than ideal solar orientation. To mitigate the effects of glare, the architects devoted the areas on each office floor directly behind the skin to circulation rather than workspace, creating a buffer zone. They provided additional protection by extending the slabs beyond the glazing, with balconies that double as shading devices. But since overhangs do not shade once the sun sinks low, the team also devised the red perforated metal panels that can be manually reconfigured by the occupants to shade critical areas. For the remaining third of the main facade, the glazing is pushed out to the slab edge, with venetian-type exterior blinds suspended from above on each level. Such shading elements have the advantage of controlling glare and, unlike interior blinds, blocking heat gain. A weather station on the roof controls the blinds as solar conditions change, and retracts them in high winds to avoid damage. Solar chimneys (top, visible at far left) in a maintenance complex at Palomar Community College are key elements in the passive operations of its non-office portion. A roof-top armature (visible near left) will support a planned 220 kW PV array, which should make the complex net positive. These blinds were almost value engineered out of the project when the contractor raised concerns about the $250,000 price tag. But the architects and engineers crunched the numbers and showed that cutting the blinds would add $400,000 in initial costs to the efficient, but mostly conventional, variable refrigerant flow (VRF) HVAC system. 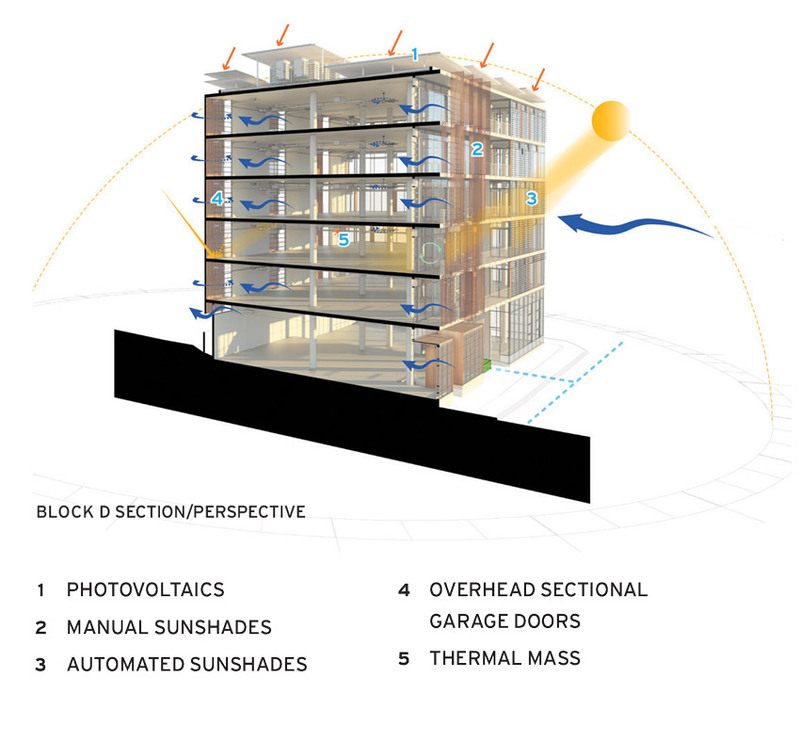 As realized, Block D should only need to rely on this mechanical climate-control system for about 40 percent of the year, says BNIM principal Matthew Porreca. For the majority of occupied hours, the building is expected to be able to capitalize on the mild coastal–Southern California climate. To make the most of these conditions, the east and west facades include glazed garage-type doors that can open to permit cross ventilation. If wind speeds become too high, occupants can temper airflow by positioning the sliding sunshades in front of the doors. These openings also facilitate “night purge” by allowing the cool night air in, so that it can “flush” the heat stored in the concrete structure’s thermal mass.